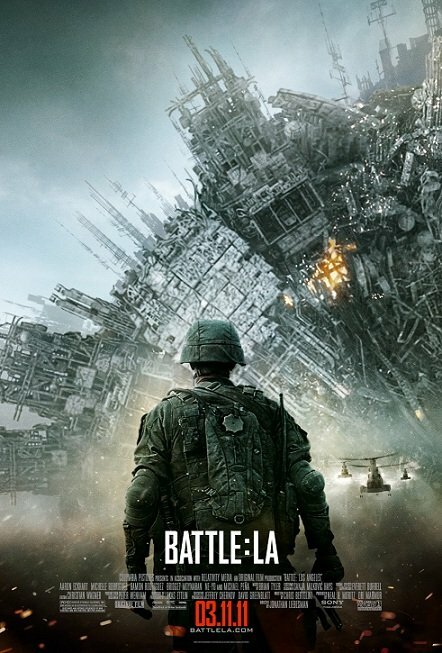 A new poster has been released by Sony for Jonathan Liebesman’s Battle: Los Angeles. "For years, there have been documented cases of UFO sightings around the world, Buenos Aires, Seoul, France, Germany, China. But in 2011, what were once just sightings will become a terrifying reality when Earth is attacked by unknown forces. As people everywhere watch the world’s great cities fall, Los Angeles becomes the last stand for mankind in a battle no one expected. It’s up to a Marine staff sergeant [Aaron Eckhart] and his new platoon to draw a line in the sand as they take on an enemy unlike any they’ve ever encountered before." The movie hits theaters 11 March. I'm reading: AWESOME NEW POSTER FOR [BATTLE: LOS ANGELES]Tweet this!